Once you move to Basel, Switzerland, the tram is the most convenient way to get around the city. The trams come frequently between 5-30 minutes apart depending on the time of day, from the very early in the morning until late at night. The hours of operation also depend on what day of the week it is and whether it’s a holiday. You’ll see both green and yellow trams as the network is operated by two separate transport providers, but you don’t really have to worry about the color, the ticketing is the same. In order to ride the tram, you need a valid ticket. While you are supposed to have a ticket for every ride you take, it’s an honor system, with random spot checks on trams and buses. If you are caught without a ticket, you’ll be fined a substantial amount. It’s also quite embarrassing to be fined, as the other tram riders give you dirty looks till the ticket agents finish (loudly) processing you. It doesn’t matter what language you speak, ignorance is not an acceptable excuse for the ticket taker! 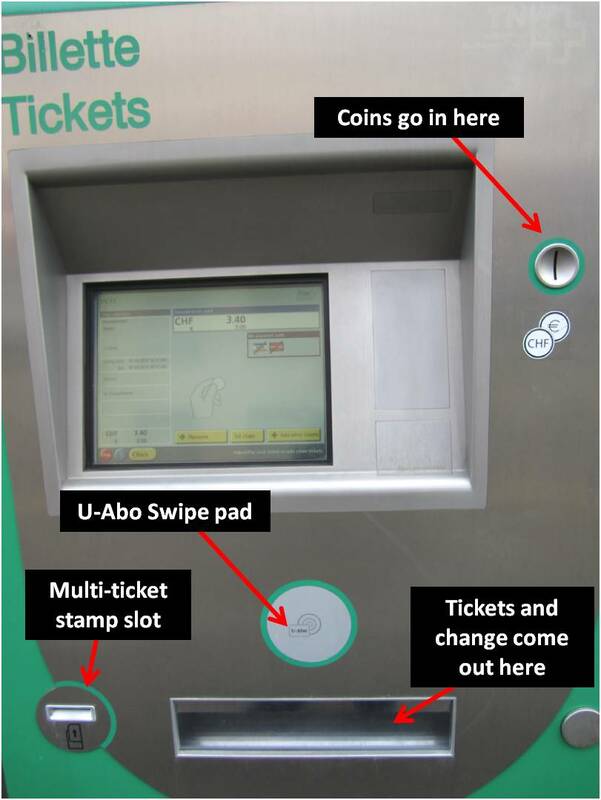 I wanted to use this post to inform you of the different ticket types available and how to use the ticket machines, so you can decide what kind of ticket or pass you need. Also, the prices change quite often, so what is listed here might not be the most current. I’ve tried to provide links to appropriate sites, so be sure to go to them for the most current costs! The GA Card – If you have a valid first or second class General Abonnement (GA) travel card, in addition to taking the train anywhere in Switzerland, you can also use all the trams and buses in Basel (and most other cities in Switzerland). You don’t have to worry about buying a ticket, just hop on and you’re good to go! Costs depend on your age, if you hold a first or second class card, or if you have a disability. Details and ordering is possible on the SBB website. You can also get card packages for you and your spouse, the whole family or even for your dog! The Tram Pass (one year/ Jahresabo) – These can be purchased at the BVB counter in Barfusserplatz, or online (German only right now). Costs depend on age and where you want to travel. Details are available on the TNW website. The Tram Pass (month by month /U-Abo) – U-Abo cards can also be bought at at the BVB kiosk in Barfusserplatz, or online. Costs depend on age and where you want to travel. Details are available on the TNW website. Once you have the card, it can be renewed on a month to month basis at any of the tram machines (see below). The U-Abo card in combination with a machine-printed monthly ticket is valid on all tram and buses, in the zones selected. The Mobility Card (from hotels) – Hotel guest in Basel will be provided with a Mobility Ticket upon check-in to the hotel. This allows free travel on the public transport system within Basel during their stay. The Tram/Bus 6-trip Card – The multi-trip card is good for six rides and gives a discount of about 10% over the standard tickets. These cards can be purchased at any Kiosk shop. The card must be punched prior to each ride, including the first. The Tram/Bus Tickets – Both day tickets and single trip tickets are available from the tram machines located at every tram stop. The day ticket is an excellent option if you plan to take more than two tram rides in a single day. Reduced ticket prices are possible to get with certain discount cards. If you purchase a half tax card (available and the Bahnhof SBB) for one, two or three years, you’ll be entitled to reduced costs for both trains within Switzerland, as well as buses and trams. Children who are six years old to 16 years old who hold a Junior Travelcard (approx. 30 CHF) can travel on trains, trams and buses, in the company of a parent holding a valid ticket, for free. Below is photo of one of the tram machines from Basel. These are located at every tram stop, generally one machine for each direction. At some of the platforms that have multiple trams stopping, machines are shared for two or more trams, and you need to look around for them (but they are very easy to find for the most part). All the machines have a touch-screen interface. These tram machines are located at every tram and bus stop. You need the correct, valid ticket on Basel trams or you might be fined 80-120 CHF. There are language buttons in the bottom right corner of the screen so you can select English, or the language you are most comfortable with. This button will change the display into English (red circle). Use the left hand side of the machine if you do not have a half tax card. Use buttons on the right hand side of the screen if you do have a half tax card. (Photo below). 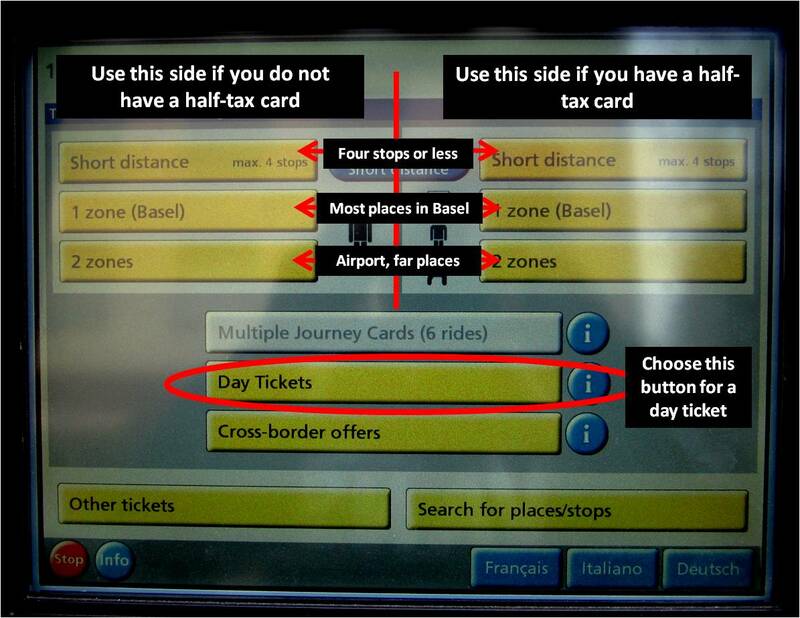 If you have a very short trip, less than four stops, you can get the short distance ticket with the top-most button. However, for most trips in Basel, you will need the 1 zone ticket. If you are going to the airport or somewhere of similar distance, you need a 2 zone ticket. The zones are defined on the map of all tram and bus lines. You need one zone to stay in the same zone and a 2 zone ticket if you are crossing zones. There are different ticket choices depending on whether or not you have a half tax card, and how far you want to go. Once you have chosen a ticket type, press the corresponding button on the screen, and the machine will display how much you owe. If you want to purchase tickets for multiple people, you can at these with the + button at the bottom of the payment screen. 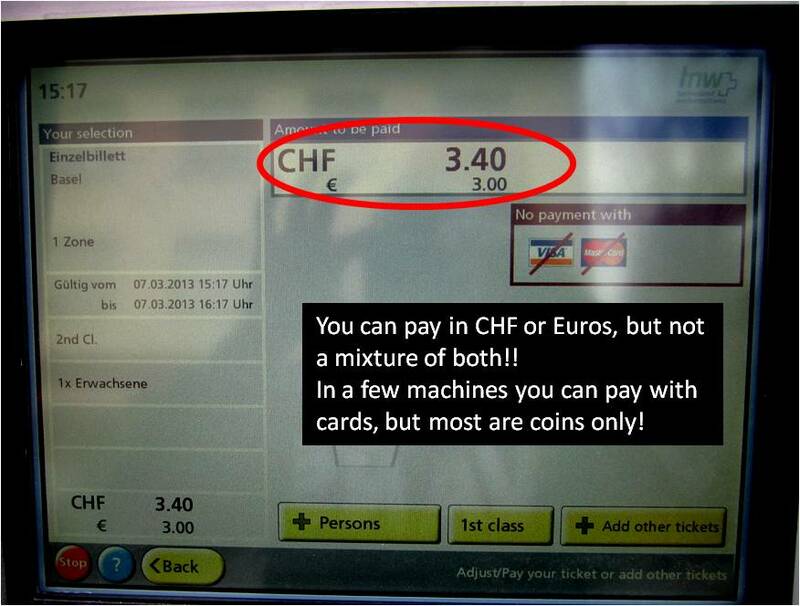 The machine displays the amount due in both CHF and Euros. You can pay in one currency or the other, but can’t mix both! The validity of your ticket is also time dependent A two zone ticket is valid for a longer duration than a one zone ticket or a short distance ticket. How long your ticket is valid until, is indicated in the upper right had corner of your ticket, next to the date. Please also remember that you’re not allowed to eat or drink on the tram, play loud music or touch the emergency brakes! I hope this makes your first encounter with a Basel tram machine simple! Just be thankful you don’t have to get tickets from the old machines from a few years ago, before they had the digital displays. The old machines had about 70 different buttons, confusing symbols and indecipherable German abbreviations! Enjoy life in Basel and the rest of the website! By the way: it’s forbidden to consume food and drinks in the trams and buses. Sadly the operating company had to do something against the rubbish, dirt and smell. Just because some people didn’t care how to behave on board the public transport. I have a folding Brompton bike and was told yesterday by the people in the ticket office that I have to buy a Velo ticket to take it on the tram unless its in a bag. They appear to be applying the same rule as with eg small dogs. this is a pity as it is as big as a small case – which you can take for free as its luggage. In the trains, I was told that it would be free to take if it was small like luggage and fitted in the luggage spaces. We are moving to Basel soon and I’m wondering if the culture is accepting of dogs. I have two well behaved, socialized dogs. I see that you can buy a tram ticket for a dog – is there a size limit? What are the rules for dogs? Dog owners must purchase a reduced-price ticket for each pet brought on to a tram. Small dogs with a maximum shoulder height of 30 cm, cats and other small, household animals that are carried in baskets or pet crates are considered luggage and can be carried free of charge. If any animal is brought out of its basket or crate at any time during the journey, then the reduced 2nd class fare is payable for each animal. I’ve never heard of a maximum size limit, but I guess common sense rules here. An Irish wolfhound might not be appropriate to bring on the tram! If you want the official rules, you need to contact bvb.ch directly and ask. The common sense rules are, the dogs should not bite (of course), bark, sniff/snuffle at other people, urinate, deficate, vomit, etc. The dog should be leashed and kept away from other people and animals. I’d strongly suggest you don’t take large dogs on crowded trams as this is stressful for both people and animals. I hope this helps!! Enjoy life in Basel. Can I just buy 1 ticket and use it again going back as long as the time permits? or I really need to buy another ticket to go back? Single tickets valid for one-way trips can be purchased from ticket machines, at the BVB Customer Center, at the BLT-Service Point, or at the SBB train station. This means that you can change lines going in the same direction, but not use your ticket for the return trip, even if the time says it’s still valid… Sorry!! Many thanks for this post-I have never been sure because many places have tickets which allow you to make any trips within a given time period. Incidentally does anyone know why Switzerland is the only Eu country that gives no travel concessions to old age pensioners? Can multiple people ride on one multi-trip card, i.e. if I validate it twice, can two people use it for the same trip? When I have a monthly U abo, can I buy a day pass for my boyfriend at reduced priced (often you van choose if you have an U abo or not and the price is different)? Or can I ony buy tickets at reduced price for myself? We are moving to Basel in July for one year, and would like to purchase the one year tram pass described above, and have used google chrome to translate the TNW website. Does anybody know what the different prices (760 CHF vs 1010 CHF for “logged in TNW” versus “not logged in” respectively mean? Also, is there any less expensive option for unlimited tram passes for someone who will not likely use the TNW train (we will have a car for longer jaunts)? This will be if you are registered in the area or live elsewhere. Its cheaper if you live in the area you are using the transport in. Just a question for all people who ride trams in Basel – do they run on a Sunday and even pretty late if I should arrive in the evening? If I’m staying at a hotel, can I ride the trams and buses as much as I want with the mobility ticket? Will it also get me to and from the airport? You will love it. Most trams start at around 5.00am and are still running at midnight or thereabouts. There are also night trams but I’ve never had to take one. Thank you very much for all your responses. I will contact my hotel to ask. Hi, I bought a 1 year Swiss Pass from the train station and I’m wondering if that qualifies me for half-tax prices when I ride the city tram in Basel? I need to go from the airport to Badischer Bahnhof. The easiest solution is the bus 50 from the airport to Basel Bahnhof SBB and than the Tram 1 from there to Badischer Bahnhof. This takes less than 30 minutes. Which ticket should I buy? The Short distance or the 2 zones? can you bring big luggage on the trams? We want to go from st johann river cruise dock to the sbb bahnhof.